A Royal Commission to investigate banks took a step closer after two senators and two Lower House members vowed they would push the Coalition Government into establishing an inquiry as soon as possible. Bob Katter, One Nation senators Rod Culleton and Malcolm Roberts and the ALP member for Herbert, Cathy O’Toole at a Townsville meeting on Saturday condemned current banking practices. They agreed that for Australia to survive record bank foreclosures and business failures, the banks had to operate within the law. Speakers believed the Coalition Government would not take any action to rein in “unlawful” banking practices which had caused multiple suicides, family break-ups and business failures around the nation. Banking industry corruption engenders support across the political spectrum, as Bob Katter, One Nation Senator Malcolm Roberts, ALP Member for Herbert Cathy O’Toole and One Nation senator Rod Culleton vow to create a royal commission to investigate unethical bank behaviour. Western Australia One Nation senator Rod Culleton slammed the record number of foreclosures describing how he too had been a victim of “dodgy” banks. “Banks operate like organised crime,” Senator Culleton said. “I’ve had a litany of evidence come into my office of receivers sinking the boot into their customers. “That’s what they think about the lamb chop on their plate; enough is enough. “The banks seem to think they are above the law because they’re unregulated, we’re going to change that.” He said if banks did not support their customers through thick and thin, he’d support the creation of a sovereign rural bank to assist farmers. “We’re here to correct things and we’re in support of a sovereign rural bank where the beneficiaries are the people who bank with it,” he said. Member for Kennedy Bob Katter told the crowd of 50 farmers, small businessmen and home owners the banks own the Australian Government. “Banks have the only government guaranteed business in Australia,” Mr Katter said. Supporting the One Nation senators and Mr Katter was Member for Herbert Cathy O’Toole saying she too had banking industry misbehaviour in her sights. “We need Australians to believe they can have confidence in the banks and financial institutions that serve us,” she said. “And we aren’t even measuring the holistic cost to the people affected in our communities. “The first place you’d want to have a look at the additional costs is in healthcare, people’s physical, mental and emotional health has been destroyed; families have been destroyed and suicides are occurring. Burdekin-district sugar industry advocate Margaret Menzell agreed a royal commission was needed but warned the meeting the Australian Banking Association was gearing up for a massive publicity blitz to ward off the establishment of an inquiry. Nine resolutions were passed by the meeting calling for the establishment of a royal commission, abolition of the arbitrary appointment of receivers by anyone, condemning the actions of government in allowing banks to act with impunity, creation of a development bank for primary and secondary industries and infrastructure, the role of police is to protect the public and then property and forbid the use of police to reinforce property repossessions, restore a grand jury system to deter corporations from engaging in unconscionable and unlawful conduct and restore compliance with Chapter 3 of the Commonwealth Constitution, property to be found disposed of unethically must be restored, the terms of reference include an investigation of the creation of credit by trading banks, a moratorium be immediately imposed on forced property sales. Ignore the NSW Liberal/National Party policies that will put you in jail for seven years if you protest against any mining activity even on your own freehold land(Deed of Grant in fee simple). This policy of the NSW Liberal/National Party Corporation only applies to a ‘’thing’. Their corporate policies are gender neutral and do not apply to a living human being. Toss out the NSW party duopoly at the election and replace them with independents and smaller parties. It is working extremely well in Queensland where two Katters Australia Party members and an independent control the excesses of the Labor Government. Bob Katter is the only Australian politician who has ever stood up to the foreign owned CSG mining companies. He has a bill on the table in Federal Parliament for an immediate moratorium on CSG, awaiting support from other members. Unfortunately the CSG companies own the Australian Liberal/National Party, ‘lock, stock and barrel.’ Do not be misled by the lies of the Labor Party. They too wholly support CSG companies, particularly in Queensland where it is a policy platform. The Greens have been in the senate for a decade or more and have not introduced a bill to stop CSG. They too are false prophets with their noses in the trough. A social movement is sweeping the nation. All around Australia people are getting involved in the fight against gas mining at the local level. Some communities are even achieving big wins against these mining giants! People are going door to door and surveying their own communities in a grassroots democracy process. 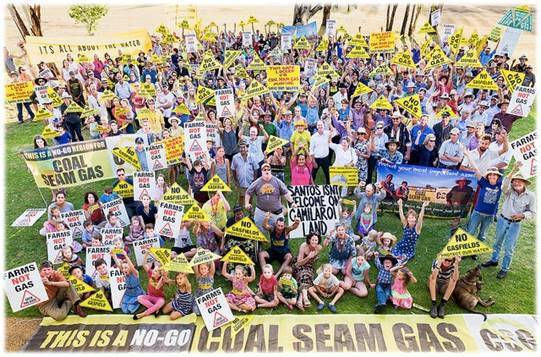 More than 360 communities have declared themselves Gasfield Free. They’re not waiting for their governments, they’re doing it for themselves! And don’t believe for a moment that this only applies to rural communities – Sydney’s Drinking Water Catchment is also under coal and gas licenses. Nothing is safe. So – do you know what could happen to your local community? I hope to see you at future events. p.s. We can’t do this alone – we’d love to have your help!